We know, geography isn't everyone's strong point. If you only have a vague idea of where Stavanger lies on a map, be sure to check out its location before you dash off! Stavanger is located in Rogaland, and approximately 35 miles (56 kilometers) from Haugesund. The population of this area of Rogaland is nearly 120,000. With Travelocity, you'll score unbelievable savings if you book a flight and accommodation package. You can also select from at least 400 airline companies and 665,000 lodging options. Want a worry-free getaway experience? Our Customer 1st Guarantee will provide you with 24/7 personal assistance on all our services. Seen a better deal? We'll meet the price and refund the difference^. You're free to alter your vacation plans with no hidden charges on our end. You know what that means? Less stress for you! And as long as you get in quick, many accommodations don't charge fees either^. An exciting getaway is only a few clicks away when you book with Travelocity. Choose from 29 accommodations in Stavanger then start counting down the days until you go! After a long day of seeing the sights, nothing beats coming home to a luxury suite. 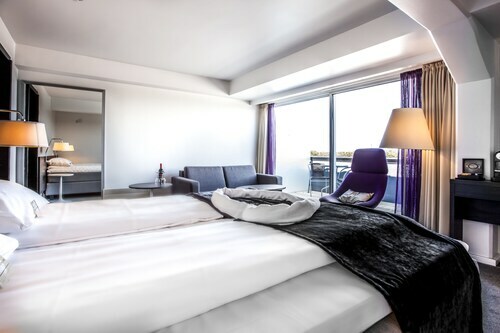 The Scandic Stavanger Forus (Bjødnabeen 2) and the Radisson Blu Atlantic Hotel, Stavanger (Olav V's Gate 3) are some of our favorite upmarket properties to consider here. That being said, you don't go on vacation to stay in your room all week. If you're searching for a cheaper option, think about the Skansen Hotel (Skansegaten 7) or the Stavanger Lille Hotel (Madlaveien 7). Where do you fly into for Stavanger? Say hello to amazing new experiences in Stavanger. Once you've headed out of Sola Airport (SVG), the middle of town will be only 7 miles (11 kilometers) away. Can I rent a car in Stavanger? Reserve a rental car via Travelocity and experience Stavanger on your own time. Collecting a car right at Sola Airport will ensure that you don't have to deal with cabs and transfers. You'll stumble across Sixt only a brief walk away. Hertz is another top option. Hertz is conveniently located in the downtown area at Hertz Bilutleie As. If you plan to stay nearby, it doesn't get easier than this. So many things to see and so little time. If you want to experience the best this city has to offer, add Stavanger Cathedral and the Stavanger Museum to your vacation itinerary. If you get the chance, stop by the Norwegian Petroleum Museum and the Museum of Archaeology too. The oceans are full of wonder and adventure, but also full of danger. Check out Stavanger Maritime Museum for a fascinating look at naval history and how we conquered the vast blue seas. Like some more options? People have said, "Art, in itself, is an attempt to bring order out of chaos." Admire the intriguing works at Rogaland Art Museum, and take a moment to envisage the story of each piece. But there's more. It's not easy to imagine how generations past survived at home without all the modernized equipment we take for granted today. Step over the threshold into Ledaal and learn exactly how they did. If you've seen all there is to see in Stavanger and have a couple more days on your hands, try not to panic. There are interesting attractions right around the corner. You may not know that you're only 18 miles (29 kilometers) away from Time. It's the perfect starting point to get to Kongeparken. This attraction is well-loved by tourists and locals alike. Situated in Stavanger, this eco-friendly hotel is within a 5-minute walk of Stavanger Cathedral and Stavanger Maritime Museum. Old Stavanger and Solvberget are also within 10 minutes. Stavanger Station is only a 2-minute walk and Stavanger Paradis Station is 21 minutes. Located in Stavanger city center near the train station, Radisson Blu Royal Hotel is also near the trendy harbor area as well as vibrant shopping, and dining options. The airport is only 15 minutes away. Located in the heart of Stavanger, this hotel is within a 10-minute walk of Old Stavanger, Stavanger Cathedral, and Telecom Museum. Stavanger Maritime Museum and Norwegian Canning Museum are also within 10 minutes. Stavanger Station is 8 minutes by foot and Stavanger Paradis Station is 23 minutes. Situated in Sola, this golf hotel is 1.2 mi (1.9 km) from Sola Beach and 2.7 mi (4.3 km) from Sola Golf Club. Fjord Line Ferry Terminal and Viking Stadium are also within 6 mi (10 km). Located in the heart of Stavanger, this hotel is within a 10-minute walk of Stavanger Ferry Port, Norwegian Petroleum Museum, and Solvberget. Øvre Holmegate and Stavanger Cathedral are also within 15 minutes. Stavanger Station is 14 minutes by foot and Stavanger Paradis Station is 29 minutes. 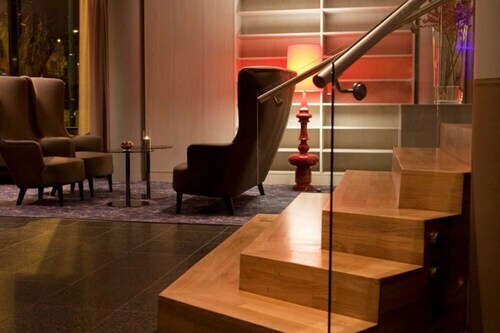 Located in the heart of Stavanger, this hotel is within a 5-minute walk of Telecom Museum and Stavanger Cathedral. Stavanger Maritime Museum and Stavanger Museum are also within 10 minutes. Stavanger Station is 5 minutes by foot and Stavanger Paradis Station is 21 minutes. 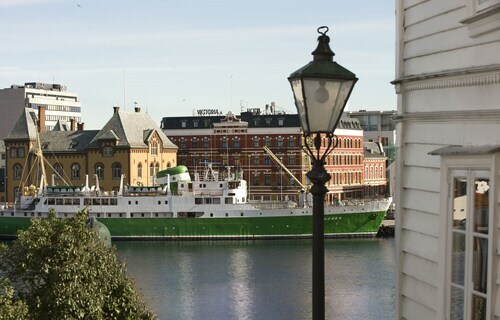 Situated in Stavanger, this hotel is within a 10-minute walk of Norwegian Petroleum Museum and Stavanger Cathedral. Stavanger Museum and Stavanger Forum are also within 3 mi (5 km). Stavanger Station is 9 minutes by foot and Stavanger Paradis Station is 26 minutes. Situated on a lake, this hotel is within a 10-minute walk of Stavanger Idrettshall and Stavanger Forum. DNB Arena and Iron Age Farm are also within 1 mi (2 km).